Gluten free bread is one of the gluten free things that I have dreaded making. I did not want to tackle it. I have had so many gluten free failures that I knew gluten free bread was sure to give me trouble, but my family misses bread, so I knew I needed to try. I started out buying a loaf of store bought bread once in a while, but honestly, that was really hard. Not only am I eating gluten free my daughter is also eating gluten free (she is doing amazingly better, more on that in another post). My daughter especially finds it hard to have bread and other gluten products around. Because of this my husband and I have decided to make the house almost completely gluten free, therefore, bread free. We have a few things and some breakfast cereal and that is about all the gluten that is in the house. The trouble with this is the rest of the family misses things like bread. Overall, they have been really good about the new diet, but I know they miss bread. I also did not realize how much I used bread as a filler item. Not quite enough soup for dinner, serve bread. Pasta for dinner, than of course you need bread. In a hurry and no time for lunch, just quickly make sandwiches. I really did not realize how much bread we ate until we no longer had it. So, I decided to tackle gluten free bread in my bread machine. Last month I posted about the bread machine I bought on sale at Macy’s usingEbates. I have now used it quite a bit and I love it. It has made gluten free bread easy. This bread even slices well for sandwiches. 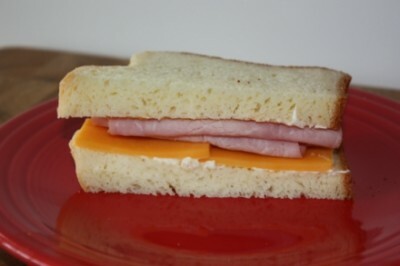 My kids were so excited to have sandwiches again and so was I. I did not know I would enjoy a sandwich so much, but after almost 3 months without sandwiches, it was nice to have one again. I will say that this is not the healthiest bread, but we are not eating this all the time. I hope to tweak it and try adding some healthier gluten free flours, but I really think it might change it too much. So, for now we are eating and enjoying this gluten free sandwich bread. Combine liquid ingredients and pour carefully into bread machine baking pan. Mix together dry ingredients and add to baking pan. Carefully place pan in the bread machine. Select normal/white cycle and start machine. ( I use the gluten free setting on my bread machine). Remove pan from the machine when bake cycle is complete. Remove bread from pan. Cool upright on a rack before slicing. Adapted from Bob’s Red Mill. I am so happy your posted this, I am missing toast so badly in the mornings. So this will be a treat. Thanks for sharing, it looks delicious. @Jenna @ Newlyweds, I wanted to let you know that there was an error in my GF bread machine bread recipe. It is fixed now, but it should have eggs in it. I wanted to make sure you knew in case you were going to make. @Lynn, Thanks Lynn, I am going to make it this week, and I am going to mention this recipe in my Menu plan for the week. I am so excited to try it! It looks AMAZING! So wonderful girl! The only thing I’d have to sub is the milk powder. I’ll have to give some thought about what I could use instead. @Org Junkie, Thank you! It would be so hard to be both gluten and milk free. It might work without the milk. Could you use a milk alternative in it, in place of the liquid? I am not sure if that would work or not, but it might be worth trying. Did you find a replacement for the dry milk powder? Just curious as we are dairy and gluten free. Thanks! we use goat milk, which doesn’t bother our dairy-sensitive folks. Lynn! Bread is definitely not an easy thing, but you’ve done it beautifully! Just came to your blog from Amy’s Slightly Indulgent Tuesdays. You have a beautiful blog, I’ll definitely be back! I’ve switched over to gluten free bread also. 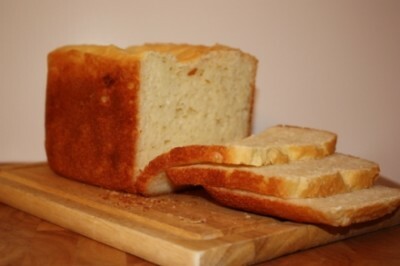 Your bread came out looking amazingly ‘regular’ – meaning it doesn’t look gluten free (if that makes any sense). 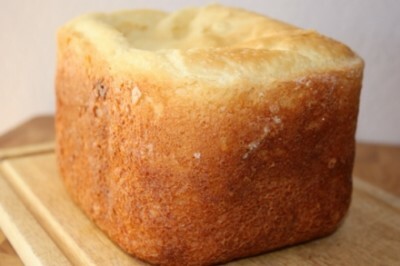 I’ve found a gluten free bread mix that I throw in my bread machine that my while family loves – even my 11 year old son. Have you tried Pamelas Products? She’s got a great gluten free mix. It runs about $5/loaf, but cheaper than buying in a store. You can find it online at Amazons or in a health food store. It also has no eggs if anyone else is like me and allergic to eggs. I’ll have to give your recipe a try if I can find something to substitute the eggs with. Thanks! @Jenn, I have not tried the Pamela Products but I have heard that they are really good. Wow, that bread looks great. I have not tried to tackle making home made gluten-free bread yet. The only ones I have tried are a couple of Bob’s Redmill mixes, one was really good and the other one was not. LOL. Trial and error. .-= Lisa´s last blog ..Renegade Kitchen =-. I’m allergic to corn – is there a subsititute for the corn starch? I have not tried it in this recipe, but often times tapioca starch will work in place of cornstarch. I would try that. I just made this, as written. Turns out a beautiful, pretty and delicious loaf. it’s very heavy, but utterly fantastic. My bread machine is 15 years old, with no gluten free setting. I searched for quite a while for a recipe that would work without a gf setting, as well as not having to mix the ingredients ahead of time or constantly adjust the settings on the machine in order to get the bread to come out well. The initial upstart cost is a little steep (perhaps I could have found the ingredients online cheaper) but considering a loaf of gf bread at the store is very expensive and not very tasty, totally worth it. I have enough ingredients to make another dozen loaves, except for the rice flour, but I intend to use my Vitamix to grind my own brown rice into usable flour. I am so glad it worked for you. I love this recipe too and agree, it is still not inexpensive to make, but tastes so much better. I actually did a little online research and most of the ingredients can be found cheaper, if not in bulk online. I will be looking more into that as I get closer to needing more. If your bread machine doesn’t have the GF setting what setting did you use? I have read that you can’t let the dough kneed a second time or it will not rise. Would really like to try this recipe but am rather scared to waste the expensive ingredients without knowing the answer to question above. Thanks! I think I would just try it on the regular setting or use the dough setting and make it in a regular bread pan in the oven. GF bread doesn’t need the second kneed, but I am not sure it would hurt the dough either. I don’t know that I answered your question, but I hope it helped. Any idea on how to make this dairy free? We found out we have to go dairy free and gluten free! 🙁 Would love to try this if I could figure out how to replace the milk powder! I have not tried it milk free sorry. I think the dairy helps the texture in this though so I am not sure how it would turn out without it. Sorry about the dairy free. Gluten free is challenging enough, adding dairy free to it would be really hard. I have almost the same recipe but use non-dairy creamer for the dried milk. That may help the non-dairy folks. I find the bread to be very dense and needs to be cut thin to avoid overpowering the other flavors in the sandwiches we make. We are working toward being a gluten free house. One of four children is gluten intolerant, another has been taken off gluten to see if some attention/behavioral issues can be helped. I’ve tweaked the recipe a bit. Partly for experimental purposes partly for practical purposes. I’ve got it at 1c brown rice flour, 1c garbanzo bean flour, 1.5c almond flour. I’ve upped the salt to 2tsp but I will likely reduce it back to 1.5tsp. I wish there was a way to make the bread come out of the machine a bit less dense but I’m thankful for what we can make on our own. ‘nuts.com’ and ‘vitacost.com’ are a couple of websites you can get good deals on bulk flour. ‘amazon.com’ is good also. I am glad to know that non dairy creamer works for dried milk. I get asked that a lot, so thanks for the information. Trying the recipe for the first time tonight. I loved that your recipe called for ingredients that I already had in my fridge or pantry and nothing off the wall to the learned GF cook. I bought a second hand bread machine weeks ago and had to psyche myself up to dealing with the machine. UGH – nerves, LOL! Will this work with a normal white setting which does 2 risings? or only with a gluten free setting of 1 rising? I have only tried it with the gluten free setting in a bread machine. But I have also made it in the mixer since posting this recipe and it turns out that way. I think a general bread setting on the bread machine would be fine, but I have not tried it. Dear Lynn,,,,,,,,I was fascinated by your story as it could have been written by me. problems. My neighbor and friend convinced me to try Gluten Free and there ended most of my problems. I only put in 1 1/2 cups of the white rice and then put in 1/2 cup of flaxmeal and a handful of sunflower seeds. This was the first bread that came out of my machine in 2 months that looked, tasted and felt like “real” bread. Thank you so much for your recipe and I hope to use many more of your Gluten Free recipes. I am so glad you enjoyed the bread. I know what it is like to miss bread and other things and what a joy it is when something turns out great. And our stories do sound very similar. I have been amazed at how much difference gluten free eating has made for me. I hope you continue to improve. And just know gluten free baking does get easier as you start to figure things out. I hope you enjoy my site and recipe! I finally gave up bread In my diet due to stomach problems even though I had no gluten allergies. Searching the web one day I found this recipe and my wife gave it a try she has made two loaves and I love it and no stomach problems. My wife wants to play with the recipe but I enjoy it just as it is. Thank you so much!! I am glad you enjoyed it. Thanks so much for letting me know. My stepdaughter recently found out that she has an intolerance to both Gluten and Yeast. Are there any recipes that address both of these problems? I would love to be able to cook something for her that she would be able to eat and enjoy. I am not sure if there is a replacement in for yeast in this. Can you do more of a biscuit type bread or roll for her? I have several gluten free ones like that. Think this would work with soy or almond milk instead of the dairy? It is hard to be dairy free, egg (yolk) free and gluten free but I am looking at it as a challenge lol. I made this recipe dairy (& soy) free by using Vance’s Dari Free (a powdered potato based milk substitute) instead of dry milk. It was REALLY good. My 5 yr old daughter and my in-laws, who do not eat gluten free or dairy free, all loved it. No one detected any off flavor. I’ve never tasted the Vance’s on it’s own, but it is great for baking! If your local store doesn’t carry Vance’s you can buy some sample packs from the company’s website. Amazon has it, too, but it’s really expensive there (as of today) . Also, when I didn’t have any cornstarch on hand I have used both almond flour & potato/almond flour mixed in its place & it turned out great. I am glad those substitutions worked. Thanks for sharing what you did! I just made this recipe for the first time and it is AMAZING. It worked perfectly to create the best GF loaf I’ve ever made!! I’ve been searching for a good recipe for about 5 years after having to go gluten free and this one worked first try. Thanks so much for making the recipe available!! I substituted the milk powder for coconut milk powder to make it dairy free which worked a treat and you can’t taste the coconut in the bread. It is available easily from supermarkets in the UK. Simply brilliant! You’ve made me one very happy lady!! I am so glad you enjoyed it! Thanks so much for taking the time to let me know. I will have to look for the coconut milk powder, it sounds like something my readers would like because many of them are dairy free. Please keep in mind that brewer’s yeast may not be gluten-free. Most yeast though is. I just looked it up because I was given misinformation that yeast contained gluten. I am so glad to know that baker’s yeast is naturally gluten-free. I was diagnosed two years ago with Celiac Disease and never did anything about it. Recently I realized just how sick I have been and this week alone I gave up most of my gluten foods. I feel so much better already. Am new to gluten free and have tried a number of recipes that all taste like egg !!!! Bought a breadman bread machine & made the recipe that was in the manual… it was heavy & wasn’t cooked all the way thru… just pulled a loaf made with your recipe out of the machine.. it looks amazing..and tastes sooooo good !! Thanks for your hard work !!! I am glad it turned out so well for you. I hope you enjoy it! My husband has just been tested/scoped and has been informed he has celiac disease. I am looking into a bread maker, to make bread. I must say this is a tad bit overwhelming, as we have to look at everything from toothpaste to, well everything ingested. We are from Edmonton, Alberta, Canada. I have found a lot of products and stores that carry or make GF free foods. I would still like to make my own GF free breads, question….what about dinner buns, would any such machine exist? or an insert to a bread maker allowing a person to make buns. First let me say that it does get easier. It is so overwhelming at first, but it really does get easier once you start to figure things out. I have never seen an insert like that for a bread machine here in the US, so I am not sure. This is my favorite recipe to use for gluten free rolls and buns. https://www.lynnskitchenadventures.com/2012/10/light-and-fluffy-gluten-free-dinner-roll.html It doesn’t use a bread machine, but it is really good and pretty easy to make. Thank you Lynn, I am sure once I get the pantry’s and cupboards all cleaned out, get his new toaster and cutting boards and all the GF free foods in place it will become easier. I just wish he wasn’t so tired most of the time. I am sure as he improves it will too. Thanks for the recipe. No it is dry milk. Gluten free bread does have a different texture than regular bread, but I have not had an issue with this recipe being dry. It may depend on the bread machine though. I would try to increase the liquid by a few tablespoons to see if that helps. Hi – I have made two loaves now using your recipe the first time, but because I am also dairy intolerant I tried with goats milk the second time. (The first loaf was so I knew what it should be like) The second loaf is more dense and cakey – I changed the water in your recipe for goats milk and omitted the milk powder. It is still an improvement on the shop bought bread however!! (not really difficult though). Hi Lynn! I love, love this recipe! I use almond milk in place of the water and skip the milk powder and it’s delicious! I’d love to try this in a bread pan in the oven (a 12″ for smaller slices so it will last linger for my kids) but want to get the temp and time right. What do you do? I am so glad that you enjoy it and that it works with almond milk! I would try it in the oven at 375 for around 30 minutes. I hope that helps. 1.5 pound loaf. I hope that helps and that you enjoy it! found this when looking up bread machines for my niece (has Celiac disease and off to college) any time i see a new GF bread i get it for her- most is at best OK. I HATE having separate meal items just for her, not because its a pain, I dont like her being separated out. In keeping with trying to be “most favretist uncle in the history of uncles” we worked on one meal for all concept HARD. Got everything GF good enough for everyone except for bread :(. -we tried this and the WHOLE family fights for it when on the table. -works fine in a “conventional” bread machine. My sister-in-laws ~15 year old one and a small footprint one i picked up for my niece. looking forward to trying your dinner roles for her next. I am so glad that it works well for you. Thanks for letting me know!